Temple of Heaven is a medieval complex of religious buildings and is located in the southeastern part of central Beijing. The shrine holds special importance as the Emperor himself used to visit this temple and pray every year for a good harvest. The shrine which was constructed from 1406 to 1420 has gained significant fame since then and is a must visit for travellers in the city. Ask permission before taking photographs. Nov 1 - Mar 31 (next year) CNY 10. Apr 1 - Oct 31 CNY 15. Combination Ticket (including the entrance fee, Hall of Prayer for Good Harvests, Circular Mound Altar & Echo Wall) CNY 30, Apr 1 - Oct 31 CNY 35. Hall of Ceremonial Music & Palace of Abstinence Nov 1 - Mar 31 (next year) CNY 10 , Apr 1 - Oct 31 CNY 10. Hall of Prayer for Good Harvests, Circular Mound Altar & Echo Wall Nov 1 - Mar 31 (next year) CNY 20 , Apr 1 - Oct 31 CNY 20. North, East, South and West Gates are open from 6:30 am to 10:00 pmNov 1 - Mar 31 (next year). Mound Altar, Echo Wall, Hall of Ceremonial Music and Palace of Abstinence are open from 8:00 am to 5:00 pm Nov 1 - Mar 31 (next year). North, East, South and West Gates are open from 6:00 am to 10:00 pm, Apr 1 - Oct 31. The main attractions are open from 8:00 am to 5:30 pm, Apr 1 - Oct 31. Take a bus from Temple of Heaven Stadium. 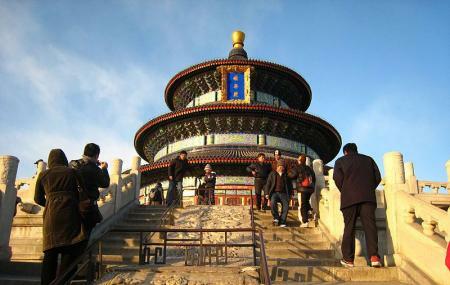 How popular is Temple Of Heaven? People normally club together Jingshan Park and Beihai Park while planning their visit to Temple Of Heaven. One of the most beautiful places in Beijing. Go early in the morning, take snacks, and spend all day here. Lots of different buildings to go through and learn about. A beautiful rose garden in the centre. Perfect weather in spring. 34 yuan entrance fee (RMB) well worth the price. If you go to the Temple of Heaven and miss this hall, you haven’t actually been to the Temple! The Hall of Prayer is the iconic building in the park and represents the location where the emperor would pray. It’s the tallest building in the park and often crowded, but it’s still gorgeous and worth a visit! After it's rebuilding this scenario had become one of my favorite places in Beijing. Art, history, peace, harmony, community, old traditions... everything remains like a calm morning even outside the city is moving faster and faster. You can stay hours looking the beauty of this non corner building which seems not to have home or ending. Just one concern, too many tourists taking photos... Disgusting. In my eyes one of the most wonderful places in Beijing! The park is very well maintained and the different areas and temples outstanding beautiful. During the day you can see old Beijingers play traditional games or dances. A must-see of the capital of China! Important side note: The most famous Temple of Heaven closes already at 1600h while the park remains open. Such a beautiful and majestic place. It really look otherworldly. The attention to detail from the square barrier (Earth) and the circular temple in the middle (heavens), nothing is left to chance. And around the palace, people enjoying their daily routine of playing card and dominos. Also a park where the elderly can play various games or even partake in aerobics if not tai Chi.